TORONTO, April 4, 2019 – According to the Royal LePage House Price Survey released today, Canada’s residential real estate market showed slowing year-over-year price growth in the first quarter of 2019. Early in 2018, Canada experienced the most significant housing correction since the 2008 financial crisis. Markets showed signs of recovery late in the year, yet the figures for early 2019 suggest that the market has once again slowed. The Royal LePage National House Price Composite, compiled from proprietary property data in 63 of the nation’s largest real estate markets, showed that the price of a home in Canada increased just 2.7 per cent year-over-year to $621,575 in the first quarter of 2019, well below the long-term norm of approximately 5 per cent. When broken out by housing type, the median price of a two-storey home rose 2.6 per cent year-over-year to $729,553, while the median price of a bungalow rose 1.1 per cent year-over-year to $513,497. Condominiums remained the fastest growing housing type on a national basis, rising 5.4 per cent year-over-year to $447,260. Looking ahead to the second quarter, Royal LePage expects national home prices to stay relatively flat throughout the 2019 spring market, with the national aggregate price of a home increasing 1.0 per cent over the next three months. Meanwhile, the housing markets in several larger Canadian cities have shown noticeable signs of slowing, with nearly half of the regions in Royal LePage’s Quarterly Forecast anticipating quarter-over-quarter price declines. 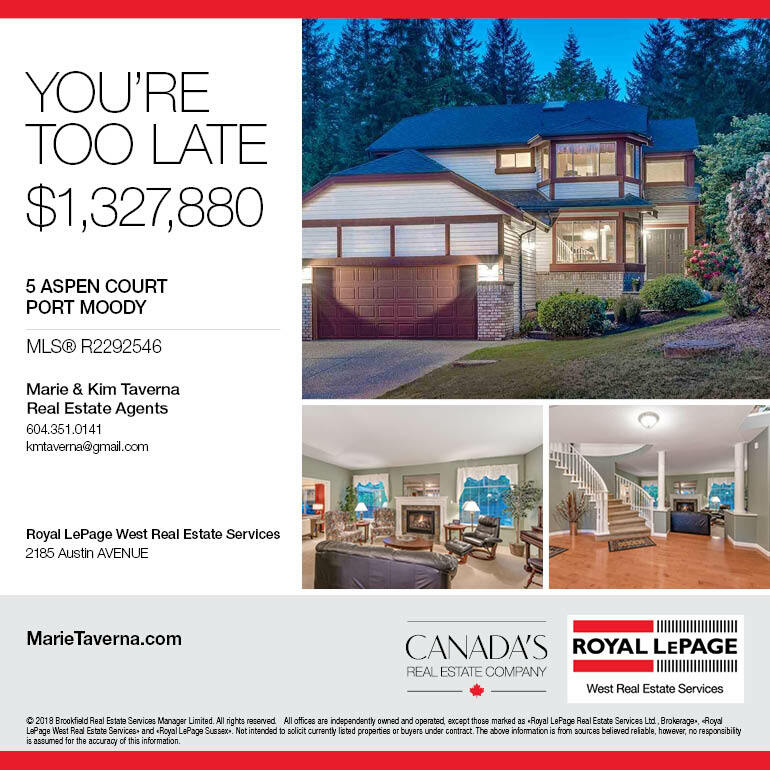 Notably, Royal LePage is expecting home prices in Greater Vancouver to fall 1.4 per cent over the next quarter. Ottawa is expected to post the highest price appreciation during the spring market and is forecast to rise 2.8 per cent to $482,459 during the second quarter. The global economy hit a soft spot entering the new year. The economic downturns in China and Germany, ongoing trade disputes, and slowing U.S. growth support a relatively muted global outlook. The upside for the Canadian housing market is the increased likelihood that interest rate hikes are on hold for the foreseeable future. In the federal budget tabled by Finance Minister Bill Morneau in March, the Canadian government announced three new or enhanced housing programs. The First-Time Home Buyer Incentive is a three-year, $1.25 billion shared equity mortgage program whereby the Canadian Housing and Mortgage Corporation (CMHC) will co-invest up to five per cent of the purchase price of an existing home. Further, for the first time in a decade, there was an increase in the registered retirement savings plan withdrawal limits in the Home Buyers Plan. The increase, from $25,000 to $35,000, was the largest since the program’s inception in 1992. Finally, an additional $10 billion in financing over nine years was earmarked for the construction of purpose-built rental housing. “Like many government initiatives, the new housing programs have supporters and critics,” said Soper. “Prospective home buyers and the hundreds of thousands of Canadians who directly or indirectly earn their living from real estate activity should remember that there were many policy areas competing for attention. In 2019, housing captured the attention and support of federal lawmakers, which is a welcome and necessary development. Driven by supply-side shortages, and augmented by an improving job market, home price appreciation in Ontario heavily influenced the national results in the first quarter of 2019. If Ontario is excluded from the Royal LePage National House Price Composite, Canadian price appreciation would sit at a modest 0.4 per cent increase compared to 2.7 per cent. Median home prices in the City of Toronto rose 5.8 per cent year-over-year in the first quarter of 2019. Two-storey home prices and bungalow home prices rose 4.8 per cent and 2.5 per cent year-over-year, respectively, while condo prices rose a weighty 9.3 per cent year-over-year. The overall GTA’s aggregate home price rose 3.4 per cent over the same period. Real estate values in Ontario’s Golden Horseshoe region continued to appreciate at a brisk clip, as local economies grew and workers from the GTA looked to trade commuting time for lower house prices. Niagara/St. Catharines, Hamilton, and Kitchener/Waterloo/Cambridge aggregate prices were up by 6.9 per cent, 6.3 per cent and 8.9 per cent, respectively. In eastern Ontario, Ottawa home prices appreciated by 7.7 per cent year-over-year. One of the principal advanced technology regions in North America, and home to much of the federal government’s labour force, household formation in the national capital region has been robust. The aggregate price of a home in Ottawa has now surpassed that of Calgary for the first time, a trend unforeseen five years ago. Other notable price increases for Ontario cities include Kingston at 10.3 per cent increase, and in western Ontario, London and Windsor both experienced double-digit home price increases, rising 10.7 per cent and 12.4 per cent year-over-year, respectively. While the overall provincial economy remains strong in British Columbia, its housing market remains vulnerable as government intervention continues to drive down real estate activity. 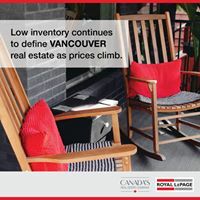 For the first time since 2012, Greater Vancouver home prices declined year-over-year, with the aggregate price dipping 1.5 per cent for the first quarter of 2019 to $1,239,306, while overall listing volumes are increasing. Some of the most desirable regions in Greater Vancouver are seeing home price declines. Properties in the region’s higher-end markets like West Vancouver, North Vancouver, Burnaby, and the City of Vancouver are all declining in price offering buyers seeking luxury housing a rare window of opportunity to enter some of Canada’s highest priced markets. Despite a recent rally in world oil prices, activity levels in the Canadian energy sector remain muted. While it is unlikely that the province will enter a technical recession, economic activity in Alberta is forecast to remain sluggish. The aggregate price of a home in Calgary, Edmonton, and Fort McMurray fell marginally by 1.5 per cent, 1.0 per cent, and 0.8 per cent to $468,974, $371,782 and $576,211, respectively. In the first quarter of 2019, the aggregate price of a home in the Greater Montreal Area increased 5.5 per cent year-over-year to $406,332. The rate of home price appreciation in the Greater Montreal Area once again surpassed rates seen in the GTA (3.4 per cent), Greater Vancouver (-1.5 per cent) and the national average (2.7 per cent). All three reported housing types saw gains this quarter, with median home prices for two-storey homes, bungalows, and condominiums rising 6.4 per cent to $514,412, 3.7 per cent to $316,159 and 5.2 per cent to $328,488, respectively. Economic activity in Atlantic Canada remains a mixed bag. Prince Edward Island is seeing solid economic growth, but persistently high unemployment rates have resulted in an aggregate price increase for a Charlottetown home of only 0.7 per cent year-over-year to $288,230. The demographics in Nova Scotia are favourable, as the province is benefiting from higher immigration and interprovincial migration numbers, and the region has a strong export sector. The aggregate price for a home in Halifax increased 1.6 per cent year-over-year to $318,733. Meanwhile, the outlook for New Brunswick is mixed, with forecasters anticipating gains from an improving commodity sector will offset a declining population and an 8.5 per cent unemployment rate. In the first quarter, the aggregate price of a home in Saint John increased 1.9 per cent year-over-year to $213,290, while the aggregate price for a home in Moncton decreased 1.3 per cent year-over-year to $192,185. Similarly, the economy in Newfoundland and Labrador is sending mixed signals, as the current unemployment rate is 11.8 per cent but natural resource projects like the syndicate-operated Hebron Project, Husky’s White Rose oil field, and Vale’s Voisey’s Bay nickel mine are all expected to ramp up production. The aggregate price of a home in St. John’s decreased 5.6 per cent year-over-year to $324,955. 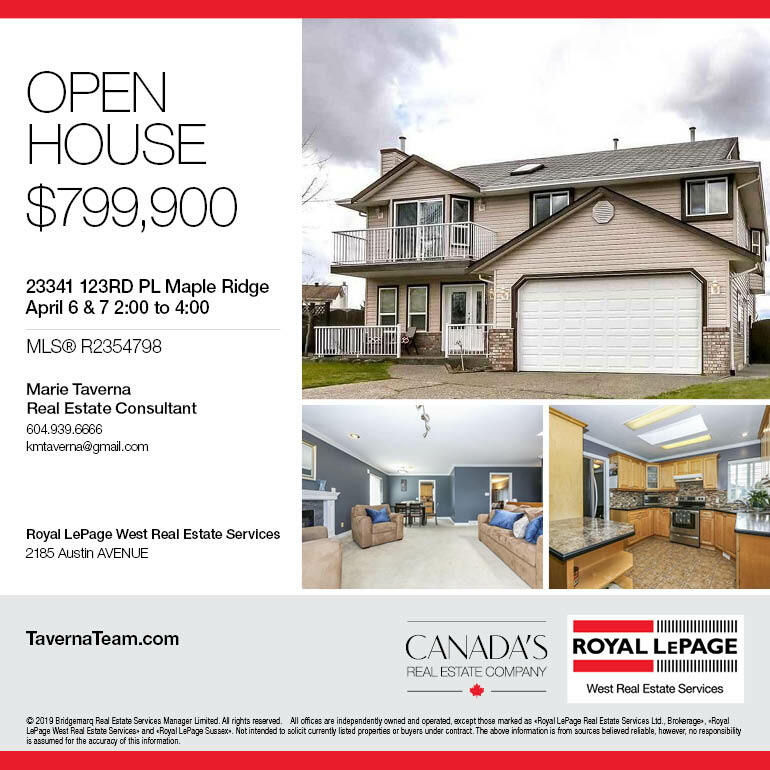 According to the Royal LePage House Price Survey1, year-over-year home prices made healthy gains in many regions across Canada in the fourth quarter of 2018, continuing the recovery from the most significant housing correction since the financial crisis. Once again, the Greater Montreal Area saw the highest year-over-year home price appreciation rate of the three largest Canadian metropolitan areas studied. The Royal LePage National House Price Composite, compiled from proprietary property data in 63 of the nation's largest real estate markets, showed that the price of a home in Canada increased 4.0 per cent year-over-year to $631,223 in the fourth quarter of 2018. When broken out by housing type, the median price of a two-storey home rose 3.9 per cent year-over-year to $745,007, while the median price of a bungalow climbed 1.5 per cent to $516,950. Condominiums continued to see the highest rate of appreciation nationally when compared to the detached segment, rising 7.2 per cent year-over-year to $447,915. "While some economists are adjusting their forecast for the economy as a whole, Canada's real estate market is beginning to emerge from the correction that began a year ago. The national real estate market is stable and should see modest price gains by the end of the 2019," said Soper. 1 Aggregate prices are calculated using a weighted average of the median values of all housing types collected. 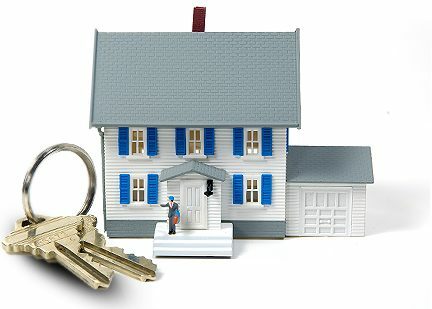 Data is provided by RPS Real Property Solutions. Maintaining your home is crucial in preserving its value. By taking small actions throughout the year, you can save money by catching problems early, or even prevent them, before significant damage takes place. 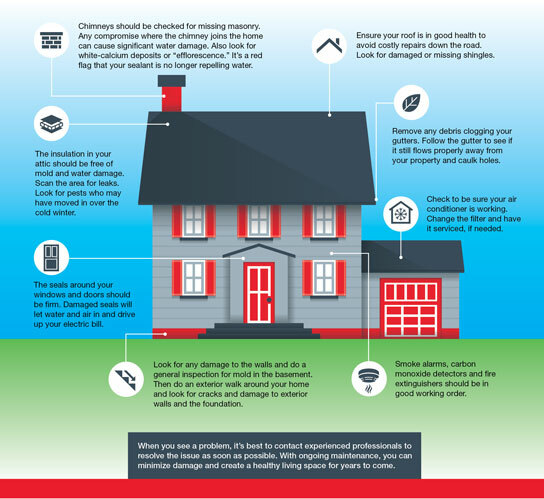 As soon as the snow thaws it's the best time to do the rounds, both inside and outside your home, to make sure everything is working the way it should. No matter its size, most people feel like there is never enough space in their kitchen. While ample space is key for a great kitchen, organizing it properly can save time too. After all, it is the most used room of a home. Here are some helpful tips to create a functional and stress-free kitchen. items and give each group a designated space. Not only will this allow you to find every item easily, you are less likely to use the space for items that don't belong there. Limit bottom cabinets to cleaning supplies, large pots or appliances and items that are rarely used. Put items you need the most in easy to grab spots. Measuring spoons, oven mitts and your go-to saucepan should be quickly accessible for stress-free, day-to-day use. Also, by keeping items close to where they are most used, you will find everything is exactly where you need it. Increase visibility in your fridge and pantry. Clear containers and additional shelving will allow you to quickly locate items in your fridge. As for your pantry, consider using clear stackable bins, adjusting your shelves and work in levels. Adding a little light will go a long way! Think outside the kitchen. Fancy dishes, large appliances that haven't been used in months and unread cookbooks are great examples of items that do not need to be stored in your kitchen. Finding new homes for less-used items outside the kitchen is one of our favourite space-saving ideas. A vibrant red, bright turquoise, regal blue or even mustard yellow. Bold colour choices can make your home stand out. With warm sunny days around the corner, it's the perfect time to plan an exterior paint project. Here is some advice to get you started. (wood, metal). Be sure to remember if you choose an oil-base or latex paint, as you can't switch back and forth, for the inevitable future touch-ups. Tape your colour swatch to the door and see how the colour looks at different times during the day. Pick a warm, dry day and get started early! Before painting, you will need to remove your door and the hardware from its surface. Thoroughly clean the door so dirt does not get trapped in the paint. Don't forget to use a primer coat. It's the best way to get the most out of your new colour. Royal LePage Shelter Foundation has received the 2018 Philanthropy Award for Outstanding Corporation from the Association of Fundraising Professionals, Greater Toronto Chapter. Presented to a corporation or its charitable foundation, this award celebrates the contribution of time, leadership and financial support of a special group of Canadians who set new benchmarks of excellence in the acts of giving and volunteering. "We are honoured to have been nominated by our partner, Canadian Women's Foundation, and to be recognized as philanthropic leaders," said Phil Soper, president and CEO, Royal LePage. "This award reflects the tireless and passionate efforts of our national network of REALTORS® and broker-owners who support the Royal LePage Shelter Foundation and its mission to promote safer homes and communities." Royal LePage Shelter Foundation has raised more than $29 million in its 20 year history and helps local women's shelters provide a safe haven and new beginnings for more than 50,000 women and children every year. It is the largest public foundation in Canada dedicated exclusively to supporting women's shelters and domestic violence prevention programs. Royal LePage offices are partnered with a women's shelter in their community and agents make donations from their sales commissions, organize fundraising events and provide in-kind contributions. "I am so grateful to Royal LePage agents, brokers and employees for their unwavering determination to help women and children lead safer, happier and more hopeful lives. I am thrilled that their efforts are being recognized with the 2018 Philanthropy Award for Outstanding Corporation," said Shanan Spencer-Brown, executive director, Royal LePage Shelter Foundation. Royal LePage is the only major real estate company with its own charity. The company pays all of the Foundation's administrative costs allowing the total amount raised to remain in local communities. Learn more at www.royallepage.ca/shelter. Held at Royal LePage offices and on front yards and driveways across Canada, the National Garage Sale for Shelter raises critical funds for local women's shelters that offer safety and support to thousands of women and children fleeing domestic violence each year. Since 2009, the National Garage Sale for Shelter has raised $3 million for women's shelters across the country. Because Royal LePage Canada covers the foundation's administrative costs and sponsors underwrite event expenses, 100% of all funds raised go directly to this important cause. Please donate gently used items to a participating Royal LePage office and visit the National Garage Sale for Shelter in your community to shop for great deals and unique treasures. You'll be helping women and children escape abuse and create a future that is safe and full of hope. For more information, please contact the Royal LePage office in your community or email shelterfoundation@royallepage.ca. TORONTO, January 2019 – According to the Royal LePage House Price Survey released today, year-over-year home prices made healthy gains in many regions across Canada in the fourth quarter of 2018, continuing the recovery from the most significant housing correction since the financial crisis. Once again, the Greater Montreal Area saw the highest year-over-year home price appreciation rate of the three largest Canadian metropolitan areas studied. November 2018 – According to Royal LePage, prices in many key winter recreational real estate markets are experiencing healthy year-over-year price appreciation, as retirees, investors and buyers looking for winter getaways continue to spur demand. Across Canada, trends vary based on the region. In western Canada, the median price of a condominium in winter recreational regions rose at a faster pace compared to detached properties, while the median price for the latter dipped. In particular, condominium prices in Whistler and Mont-Tremblant (Station) increased 26.5 per cent and 30.0 per cent, respectively. Condominium prices in Canmore also saw significant appreciation when compared to last year, alongside a considerable increase in sales activity. Quebec’s strong economic performance and consumer confidence have fueled demand for the region’s winter recreational properties as buyers with more discretionary income from within the province put upward pressure on recreational property prices. In Collingwood, Ontario, median prices have also made healthy gains, as residents within Toronto and the Golden Horseshoe flock to the region’s accessible year-round amenities. In Canmore, which is situated a beautiful 20-minute drive from Banff, the median price for a detached home dipped slightly by 1.1 per cent year-over-year to $918,500. In contrast, the median price for a condominium surged 9.6 per cent year-over-year to $472,000. Hawker also mentioned that with limited land for future development keeping values intact, it is likely that baby boomers and Gen Xers will continue to purchase recreational retirement properties in the region. In the Municipality of Whistler, home to Whistler and Blackcomb Mountains, property prices in both the detached and condominium segments have increased significantly. When compared to the same period last year, the median price of a detached property home rose 14.5 per cent year-over-year to $2,400,000, while the median price of a condominium increased significantly, rising 26.5 per cent year-over-year to $610,000. Kelly added that growth in the tourism sector over the last five years has fueled an increased demand for condominium properties, as many buyers are searching for short-term income rental and investment properties. Meanwhile in Invermere, sales activity has remained relatively stable while the median price of a detached home has decreased year-over-year to $401,250, increasing affordability in the region. Benson added that the British Columbia wildfires also impacted sales activity over the summer months. In 2019, Invermere is expected to experience the same positive uptick in activity. Detached homes in Kimberley made the largest median price gain of regions surveyed as demand far outstriped supply. Potential buyers were shopping with less than 40 per cent of the typical inventory level for the region. In Collingwood, median property prices continued to increase in 2018. Detached property home prices rose 6.3 per cent year-over-year to $549,900. Properties in the condominium segment experienced an uptick in value as well, rising 5.4 per cent year-over-year to $407,700, demonstrating a steady demand for recreational properties in the region. Crouch also added that there has been an increase in sales activity in the $300,000 to $500,000 price range. In 2019, the demand for recreational properties is expected to remain steady, as baby boomers purchase these properties for use in their retirement years. Median home prices in most of Quebec’s Laurentians have risen this year compared to last year. Mont-Tremblant, Saint-Sauveur,Morin-Heights and Saint-Faustin/Lac-Carréare seeing increased demand from Gen Xers looking for a seasonal getaway and to enjoy fresh air just outside Montreal. Demand was mostly seen within the condominium segment this year, as recreational property buyers sought homes that require no maintenance. 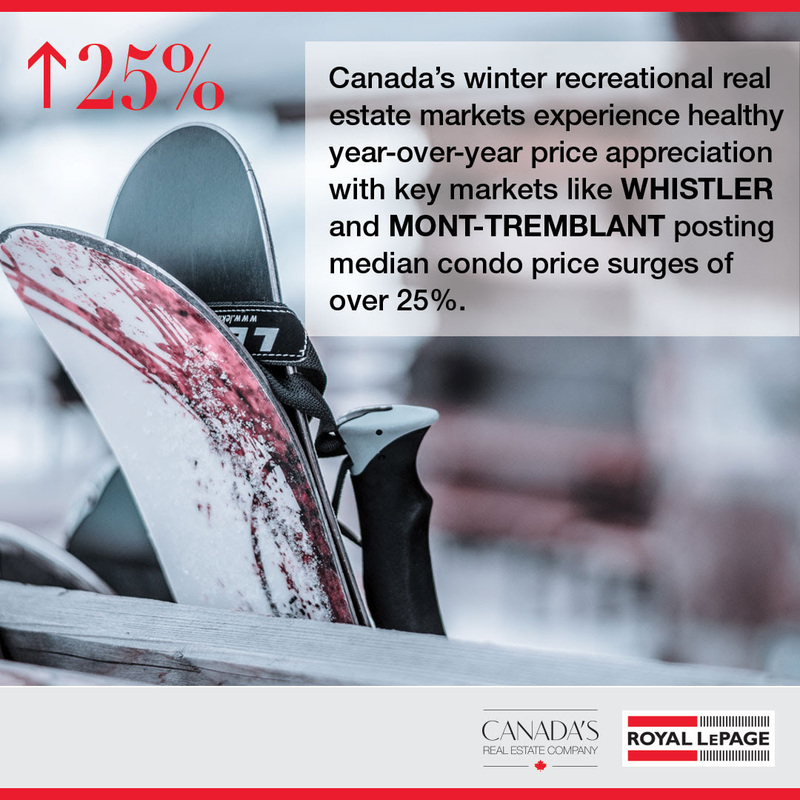 Between January and October of 2018, the median price of a condominium at the foot of Mont-Tremblant’s ski station saw a significant increase climbing 30.0 per cent to $325,000, compared to the same period in 2017. During the same period, year-over-year, the median price of a condominium in Mont-Tremblant’s Village rose 8.1 per cent to $186,500 while the price of a detached home increased 1.9 per cent to $425,000. Further away from the slopes, detached property home prices in St-Jovite remained relatively flat, dipping 1.3 per cent year-over-year to $230,000, while the median price of a condominium saw a 2.2 per cent increase, during the same period to $199,950. Closer to Montreal, the median price of both detached homes and condominiums in Saint-Sauveur increased 18.9 per cent year-over-year, reaching $305,000 and $270,000, respectively. Fueling these increases is demand from Montreal’s North Shore spreading further into the Laurentians and Greater Montreal Area’s employment growth in recent years. During the same period, Morin-Heights saw detached property prices appreciate 13.0 per cent year-over-year to $315,000. In contrast, home prices in the Saint-Faustin/Lac-Carré area decreased a more modest 4.9 per cent to $173,500. Although sales should slow slightly in December, Dalbec expects the market to pick up again near the end of January 2019 as buyers return to the market after the holidays. In Estrie, the Bromont, Orford and Sutton regions continue to be a prime target for Montrealers looking to buy recreational property. In Bromont, as a result of increasing demand for condominiums, the median price in that segment rose 8.9 per cent year-over-year to $247,500, while the price of a detached home in the region remained relatively flat, appreciating 1.4 per cent to $355,000. Meanwhile, Orford and Sutton single-family home prices rose 12.6 and 10.1 per cent to $295,000 and $345,000, respectively. “With their proximity to the Island of Montreal and its South Shore with ski resorts and lakes nearby, Estrie remains a popular destination for buyers,” said Christian Longpré, agency owner and real estate broker, Royal LePage Au Sommet. Waterfront and slope side properties are most coveted by buyers, although these are usually more expensive. Meanwhile, numerous baby boomers are buying secondary homes with the intention of moving in permanently when they retire in a couple years. Serving Canadians since 1913, Royal LePage is the country’s leading provider of services to real estate brokerages, with a network of over 18,000 real estate professionals in more than 600 locations nationwide. Royal LePage is the only Canadian real estate company to have its own charitable foundation, the Royal LePage Shelter Foundation, dedicated to supporting shelters for women and children as well as educational programs aimed at ending domestic violence. 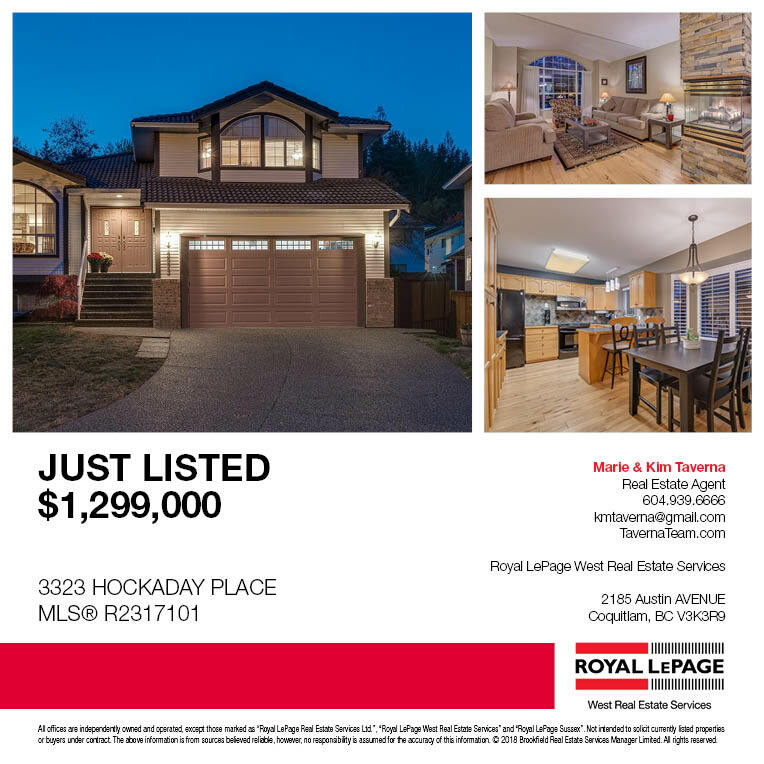 Royal LePage is a Brookfield Real Estate Services Inc. company, a TSX-listed corporation trading under the symbol TSX:BRE. YOUR SEARCH IS OVER!!! This TOP floor 1000+ square feet, CORNER unit is what you have been waiting for. 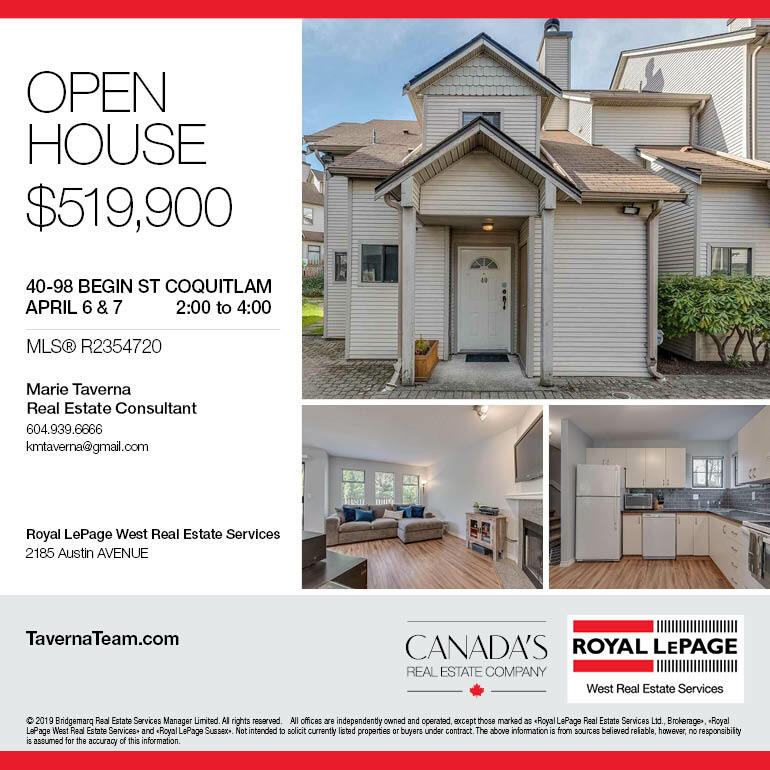 Located in a popular area of Port Coquitlam. 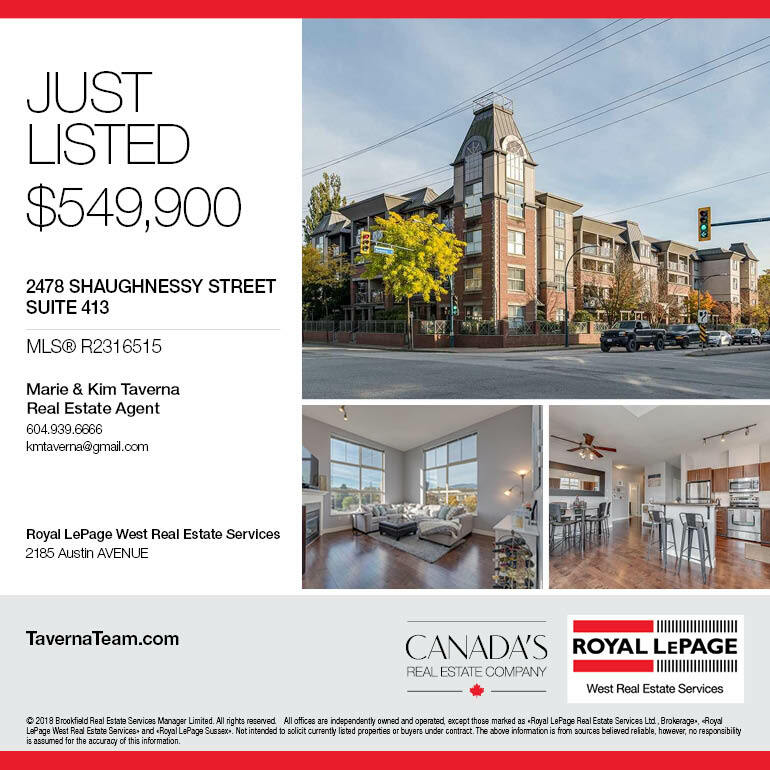 This fabulous condo has TALL ceilings with LARGE windows to let the natural LIGHT in. Lovely engineered HARDWOOD floors. Great kitchen with STAINLESS STEEL appliances & GRANITE counter tops. Breakfast bar for your morning coffee. Large living room with gas fireplace, perfect for holiday entertaining. Master suite with 2 closets & ensuite. Good size second bedroom. Main bath with 4 pieces. In suite laundry. Storage unit. Covered balcony for year round BBQing. Walk to the coffee shop, grocery store or to Gates Park with your favorite 4 legged friend. Transit is a hop, skip & a jump away. Fabulous restaurants nearby. This home is a pleasure to show. To find out what is happening in your next of the woods, please feel free to contact us and chat. TORONTO, May 10, 2018 – Canada’s spring luxury real estate market is well underway in Canada’s largest cities. 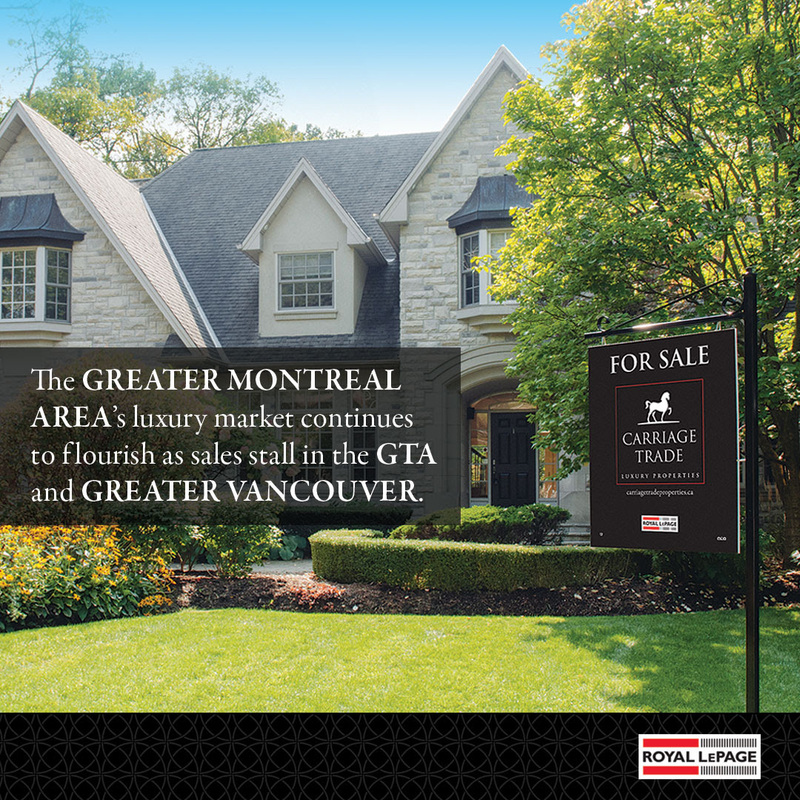 While sales in Greater Vancouver and the Greater Toronto Area (GTA) are significantly down in the first four months of the year, luxury home prices have remained relatively resilient, according to Royal LePage. Overall, sales activity declined in Greater Vancouver and the GTA luxury real estate market as both sellers and buyers adjusted to federal and provincial measures affecting both domestic and foreign buyers. The introduction of the new mortgage stress test implemented by the Office of the Superintendent of Financial Institutions (OSFI) at the beginning of 2018 created market turmoil as buyers moved to the sidelines in order to gauge the impact on luxury home prices, similar to what was witnessed in the overall residential resale market. More significantly, in British Columbia, the 2018 provincial budget included policies targeting foreign and domestic buyers who do not pay tax in the province, as well as a tax increase for all homes over $3-million through increases to the property transfer and school tax. Similarly, the non-resident property tax included in Ontario’s 16-Point Fair Housing Plan dampened price expectations for the GTA region. 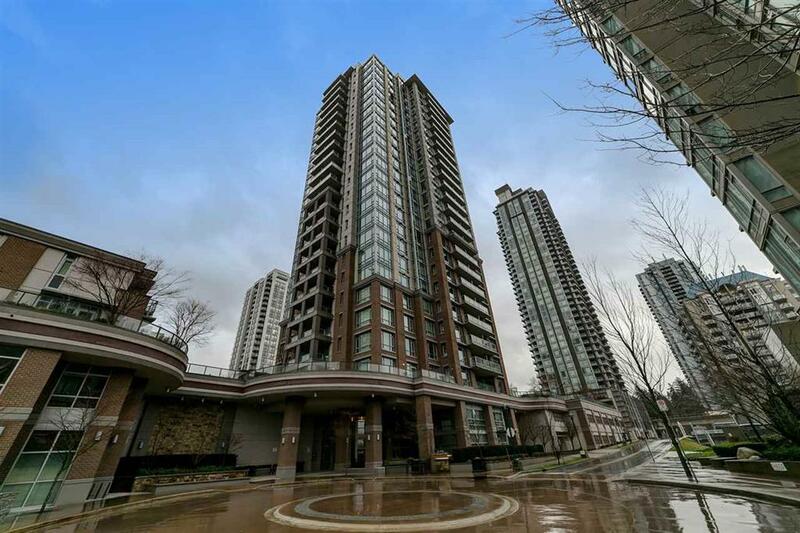 During the first four months of 2018, price appreciation of a luxury condominium in Greater Vancouver and the GTA outpaced that of a luxury detached home, with median condominium prices rising by 7.0 per cent and 10.4 per cent year-over-year, respectively. For the same period, the median price of a luxury condominium in the Greater Montreal Area and Ottawa rose by 3.9 per cent and 4.0 per cent, respectively, while Calgary posted the only decline, decreasing 6.1 per cent. The Greater Montreal Area posted the largest year-over-year price gain in the detached luxury home segment, increasing 9.1 per cent to $1,569,515 in the first four months of the year. During the same period, detached luxury homes in Ottawa (6.3%) and Greater Vancouver (5.2%) also saw prices rise, while home values in Calgary (0.6%) and the Greater Toronto Area (-0.2%) remained flat. “Somewhat unusual in historical terms, and reflecting an important demographic shift happening across North America, appreciation in the luxury condominium market is outpacing the traditional target for large value residential property investment, the detached house,” said Soper. “Baby Boomers are finally exiting their large family homes, and luxury condos, with their low maintenance lifestyles, are the favoured destination. The momentum behind luxury condominium price growth is forecast to continue through the year and into the 2019 spring market in all cities surveyed, with the exception of Calgary. When broken out by region, the median price of a luxury condominium in the GTA is forecast to post the largest price gain, rising 8.0 per cent to $1,847,194 in the first four months of 2019 when compared to the same period in 2018. Over the same timeframe, luxury condominiums in both Ottawa and the Greater Montreal Area are forecast to increase 3.0 per cent. Calgary is the only city surveyed that is expected to see the median price of a luxury condominium dip in spring 2019 when compared to 2018, decreasing 4.0 per cent year-over-year. decreasing 3.0 per cent year-over-year to $5,619,153, while properties in this segment in the GTA are estimated to remain flat (0.0%) over the same period. The Greater Montreal Area and Ottawa are both forecast to increase 5.0 per cent year-over-year, and detached luxury homes in Calgary are expected to rise 2.0 per cent during the same period. Despite a sharp decline in sales activity, some price gains made during last year’s luxury spring market carried through to the start of 2018. For the first four months of the year, the median price of a luxury detached home in Greater Vancouver rose 5.2 per cent year-over-year to $5,792,941, while the median price of a luxury condominium rose 7.0 per cent year-over-year to $2,503,873 during the same period. 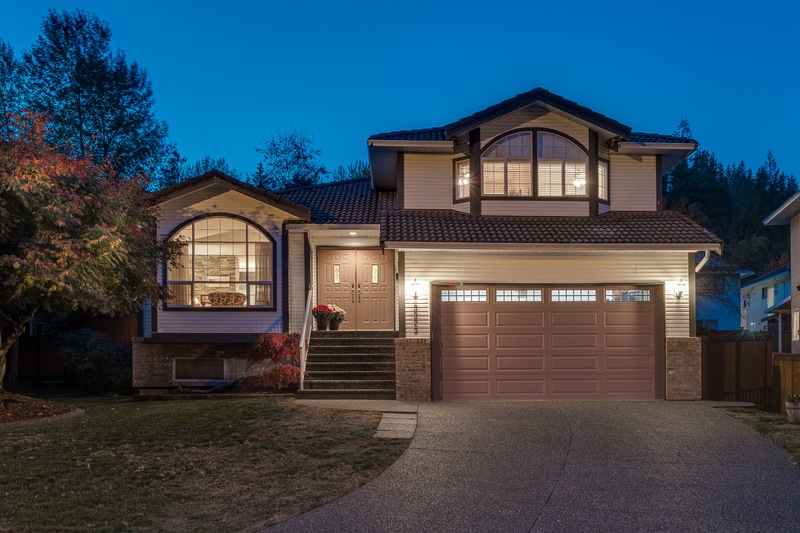 Looking ahead to the 2019 spring market, the median price of a luxury detached home in Greater Vancouver is forecast to decrease 3.0 per cent to $5,619,153, when compared to the first four months of 2018. In contrast, luxury condominiums are forecast to increase 2.0 per cent to $2,553,950 during the same period. During the first quarter of 2018, sales of detached luxury homes decreased 38.2 per cent compared to the same period in 2017, while luxury condominiums decreased 26.5 per cent. Smeaton added that the long-term outlook for luxury detached homes is positive for the region. The Royal LePage Carriage Trade Luxury Properties Spring Luxury Market Release provides information on the two most common types of luxury housing in Canada using lower thresholds of three times the median value of each segment relative to the overall property type’s median home value in that city. Housing values use company data in addition to data and analytics from its sister company, RPS Real Property Solutions, the trusted source for residential real estate intelligence and analytics in Canada. 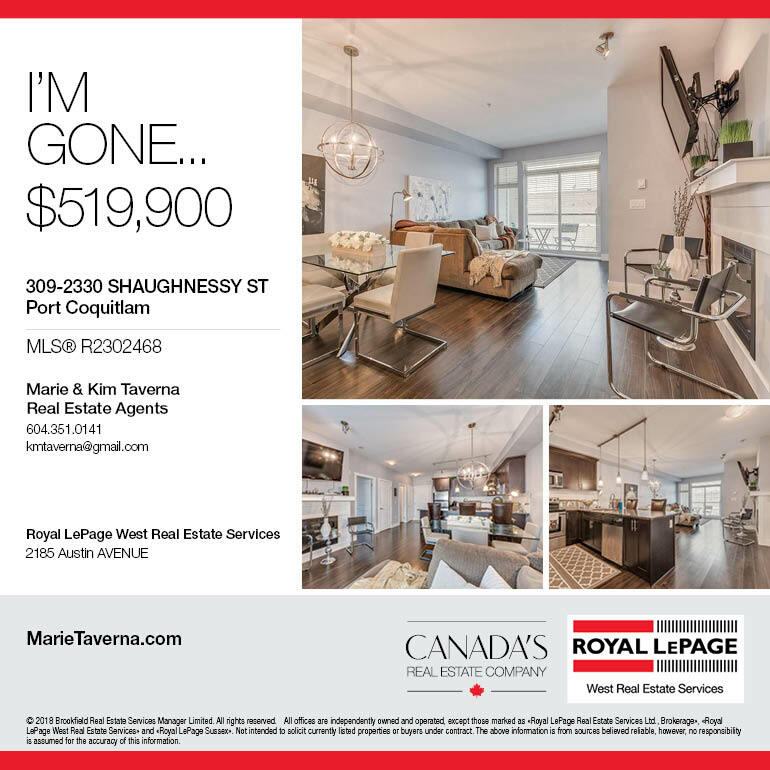 Commentary on housing are provided by Royal LePage residential luxury real estate experts, based on their opinions and market knowledge. Lower thresholds used for detached luxury homes: Greater Toronto Area ($3,046,206), Greater Montreal Area ($1,187,118), Greater Vancouver ($4,630,147), Calgary ($1,660,794), and Ottawa ($1,358,179). Lower thresholds used for luxury condominiums: Greater Toronto Area ($1,454,446), Greater Montreal Area ($993,259), Greater Vancouver ($1,926,084), Calgary ($849,463), and Ottawa ($900,911). Serving Canadians since 1913, Royal LePage is the country’s leading provider of services to real estate brokerages, with a network of close to 18,000 real estate professionals in more than 600 locations nationwide. Royal LePage is the only Canadian real estate company to have its own charitable foundation, the Royal LePage Shelter Foundation, dedicated to supporting shelters for women and children as well as educational programs aimed at ending domestic violence. 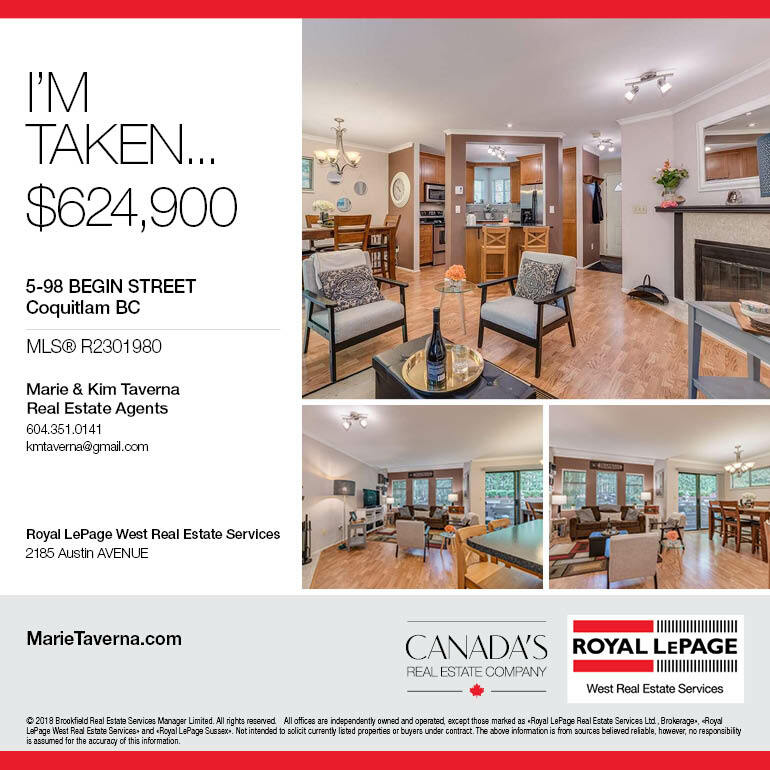 Royal LePage is a Brookfield Real Estate Services Inc. company, a TSX-listed corporation trading under the symbol TSX:BRE. April 2018 – According to Royal LePage, Canada’s leading real estate services provider, peak millennials are seeing significant disparities in the properties they can afford in the country’s largest cities. With a median salary of $38,148, this generation typically has a maximum home buying budget of $203,246. This factors in a 20 per cent down payment, and the impact of OSFI’s new stress test, which has reduced the average peak millennial’s purchasing power by approximately 16.5 per cent, or $40,103. However, given that the aggregate Canadian home value currently rests at $605,512, many must either bide their time or look for creative solutions to finance a home purchase. In major cities across Canada, a growing number of peak millennials will save, pool their money with a partner and/or borrow funds from their parents, many of whom are downsizing in retirement and can financially contribute to their child’s first home purchase. While peak millennials are largely able to afford their monthly mortgage expenses, coming up with an adequate down payment often proves to be the greatest hurdle to homeownership among the demographic. In areas with high home values, like Greater Vancouver and the Greater Toronto Area, a 20 per cent down payment often equates to over $160,000, or roughly the same price as a home in Moncton, New Brunswick. When combined, a dual income peak millennial couple has a typical maximum budget of $406,479, exclusive of any help from the bank of mom and dad. In the first quarter of 2018, the average Canadian home listed between $325,000 to $425,000 (the price range of homes accessible to this dual-income demographic, with the higher end often receiving some financial assistance from their families) had 2.7 bedrooms, 1.8 bathrooms and 1,269 sq. ft. of living space. When broken out by region, homes listed between $325,000 to $425,000 in Greater Vancouver had an average of 1.5 bedrooms and 1.2 bathrooms, while homes in the Greater Montreal Area and the Greater Toronto Area offered peak millennial purchasers an average of 2.9 and 1.7 bedrooms and 1.5 and 1.4 bathrooms, respectively. Meanwhile, on the east coast, Halifax delivered the biggest bang for a peak millennial’s buck, offering them an average of 3.1 bedrooms and 3.0 bathrooms. In fact, of the seven cities studied across Canada, the region offered the most living space overall for prospective peak millennial purchasers, with homes in this price range averaging 1,736 sq. ft. In contrast, Greater Vancouver offered prospective peak millennial purchasers the least amount of living space with an average of 788 sq. ft.
“There are striking differences in the options available to peak millennial purchasers across Canada,” continued Soper. “While $425,000 will largely net an entry-level condo in Greater Vancouver and the Greater Toronto Area, on the east coast, this budget unlocks the majority of the market, offering prospective millennial purchasers large, detached homes with all of the bells and whistles. The Metro Vancouver housing market saw fewer home buyers and more home sellers in April. The Real Estate Board of Greater Vancouver (REBGV) reports that residential property sales in the region totalled 2,579 in April 2018, a 27.4 per cent decrease from the 3,553 sales recorded in April 2017, and a 2.5 per cent increase compared to March 2018 when 2,517 homes sold. Last month’s sales were 22.5 per cent below the 10-year April sales average. There were 5,820 detached, attached and apartment properties newly listed for sale on the Multiple Listing Service® (MLS®) in Metro Vancouver in April 2018. This represents an 18.6 per cent increase compared to the 4,907 homes listed in April 2017 and a 30.8 per cent increase compared to March 2018 when 4,450 homes were listed. The total number of properties currently listed for sale on the MLS® system in Metro Vancouver is 9,822, a 25.7 per cent increase compared to April 2017 (7,813) and a 17.2 per cent increase compared to March 2018 (8,380). “Home buyers have more breathing room this spring. They have more selection to choose from and less demand to compete against,” Moore said. For all property types, the sales-to-active listings ratio for April 2018 is 26.3 per cent. By property type, the ratio is 14.1 per cent for detached homes, 36.1 per cent for townhomes, and 46.7 per cent for condominiums. The MLS® Home Price Index composite benchmark price for all residential properties in Metro Vancouver is currently $1,092,000. This represents a 14.3 per cent increase over April 2017 and a 0.7 per cent increase compared to March 2018. Sales of detached properties in April 2018 reached 807, a 33.4 per cent decrease from the 1,211 detached sales recorded in April 2017. The benchmark price for detached properties is $1,605,800. This represents a 5.1 per cent increase from April 2017 and a 0.2 per cent decrease compared to March 2018. Sales of apartment properties reached 1,308 in April 2018, a 24 per cent decrease from the 1,722 sales in April 2017. The benchmark price of an apartment property is $701,000. This represents a 23.7 per cent increase from April 2017 and a 1.1 per cent increase compared to March 2018. Attached property sales in April 2018 totalled 464, a 25.2 per cent decrease compared to the 620 sales in April 2017. The benchmark price of an attached unit is $854,200. This represents a 17.7 per cent increase from April 2017 and a 2.3 per cent increase compared to March 2018. The Quarter 1 2018 Royal LePage House Price Survey was released. The Royal LePage National House Price Composite, compiled from proprietary property data in 63 of the nation's largest real estate markets, showed that the price of a home in Canada increased 6.2 per cent year-over-year to $605,512 in the first quarter of 2018. At the outset of the quarter, sales activity levels fell at both national and regional levels year-over-year, in part due to an observed "pull-ahead" in transactions at the end of 2017, as buyers sought to solidify home purchases before the new mortgage rules came into effect. Greater Vancouver witnessed the most significant condominium price gains among Canada's major metropolitan areas, posting a 19.8 per cent increase to a median price of $668,342. In the GTA, the median price of a condominium increased 11.9 per cent year-over-year to $471,854 in the first quarter, and decreased slightly on a quarter-over-quarter basis, decreasing 1.3 per cent. Bucking this trend, condominiums in the Greater Montreal Area appreciated 3.5 per cent to $314,554 year-over-year compared to two-storey homes, which appreciated 8.3 per cent to $492,751. Beginning in the first quarter of 2018, seven real estate markets were added to the Royal LePage National House Price Composite. The new regions are: Abbotsford (BC), Burlington (ON), Guelph (ON), Barrie (ON), Thunder Bay (ON), Saguenay (QC) and Fort McMurray (AB). British Columbia was a leading Canadian economic powerhouse in 2017, but its growth is expected to slow over the next two years as measures to curb the housing market set in. 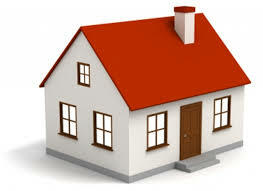 However, in turn, fewer home listings are expected to put continued upward pressure on prices. The province’s unemployment rate was 4.7 per cent in March, well below the national average. Furthermore, B.C. is one of the few provinces that is adding population via three core channels: natural increase, international immigrants, as well as through interprovincial in-migration, further supporting housing demand in the region. In the first quarter of 2018, the aggregate price of a home in Greater Vancouver rose 10.3 per cent year-over-year to $1,280,014, while the City of Vancouver saw an increase of 10.1 per cent to $1,487,048. Meanwhile, surrounding suburbs continued to see relatively high year-over-year appreciation as a result of increasing demand for lower-priced properties outside the city center. During the same period, Langley, Surrey, Coquitlam and Burnaby posted home price increases of 18.5 per cent, 16.3 per cent, 15.3 per cent and 11.7 per cent to an aggregate price of $933,725, $879,848, $1,088,334 and $1,132,570, respectively. 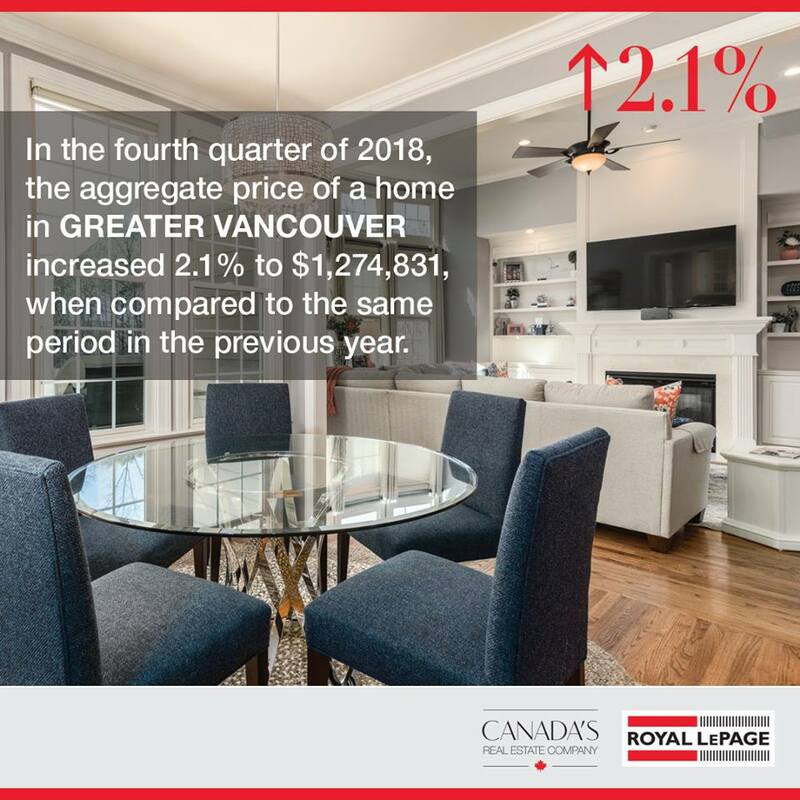 Q1 2018 Royal LePage House Price Survey was released. To find out what is happening in your neighbourhood, please call us and we would love to talk to you. Canadian housing starts fell 3 per cent on a monthly basis in march to 225,213 units at a seasonally adjusted annual rate (SAAR). The six-month trend in Canadian housing starts was steady at about 226,000 units SAAR. In BC, total housing starts jumped 48 per cent on a monthly basis to 46,629 units SAAR with multiple unit starts rising over 60 per cent. On a year-over-year basis, total starts in the province were 4 per cent higher. Total starts in the Vancouver CMA were up 60 per cent on a monthly basis after falling close to 40 per cent in February. Year-over-year, Vancouver starts were up 6 per cent. The 32,000 unit annual pace set in March was the result of an increase in both condo and rental units in core parts of the Metro area including the City of Vancouver, Richmond and North Vancouver. In the Victoria CMA, housing starts were down 5 per cent on a monthly basis but were almost double the level of March 2017 due to a surge of new multi-unit starts. Apartment starts were 77 per cent higher than March last year while single detached starts were down 32 per cent. In the Kelowna CMA, new home construction bounced back from a slow February with total housing starting rising by over 4 times the previous months activity. However, starts were down 68 per cent compared to what was a very busy March of 2017. Housing starts in the Abbotsford-Mission CMA increased 71 per cent on a monthly basis but were down 20 per cent year-over-year, largely due to lower single detached starts. Multiple unit starts were essentially flat compared to last year. The British Columbia Real Estate Association (BCREA) is the professional association for more than 20,000 REALTORS® in BC, focusing on provincial issues that impact real estate. Working with the province’s 11 real estate boards, BCREA provides continuing professional education, advocacy, economic research and standard forms to help REALTORS® provide value for their clients. Home buyers and sellers were less active in Metro Vancouver throughout the first quarter of 2018. The Real Estate Board of Greater Vancouver (REBGV) reports that residential home sales in the region totalled 2,517 in March 2018, a 29.7 per cent decrease from the 3,579 sales recorded in March 2017, and a 14 per cent increase compared to February 2018 when 2,207 homes sold. Last month’s sales were 23 per cent below the 10-year March sales average. There were 6,542 home sales on the Multiple Listing Service® (MLS®) in Metro Vancouver during the first quarter of 2018, a 13.1 per cent decrease from the 7,527 sales over the same period last year. This represents the region’s lowest first-quarter sales total since 2013. There were 4,450 detached, attached and apartment properties newly listed for sale in Metro Vancouver in March 2018. This represents a 6.6 per cent decrease compared to the 4,762 homes listed in March 2017 and a 5.4 per cent increase compared to February 2018 when 4,223 homes were listed. There were 12,469 homes listed for sale in Metro Vancouver during the first quarter of 2018, a 0.8 per cent decrease from the 12,568 sales over the same period last year. This represents the region’s lowest first-quarter new listings total since 2013. The total number of homes currently listed for sale on the MLS® system in Metro Vancouver is 8,380, a 10.5 per cent increase compared to March 2017 (7,586) and a 7.1 per cent increase compared to February 2018 (7,822). For all property types, the sales-to-active listings ratio for March 2018 is 30 per cent. By property type, the ratio is 14.2 per cent for detached homes, 39.9 per cent for townhomes, and 61.6 per cent for condominiums. The MLS® Home Price Index composite benchmark price for all residential properties in Metro Vancouver is currently $1,084,000. This represents a 16.1 per cent increase over March 2017 and a 1.1 per cent increase compared to February 2018. Sales of detached properties in March 2018 reached 722, a decrease of 37 per cent from the 1,150 detached sales recorded in March 2017. The benchmark price for detached properties is $1,608,500. This represents a 7.4 per cent increase from March 2017 and a 0.4 per cent increase compared to February 2018. Sales of apartment properties reached 1,349 in March 2018, a decrease of 26.7 per cent compared to the 1,841 sales in March 2017. The benchmark price of an apartment property is $693,500. This represents a 26.2 per cent increase from March 2017 and a 1.6 per cent increase compared to February 2018. Attached property sales in March 2018 totalled 446, a decrease of 24.1 per cent compared to the 588 sales in March 2017. The benchmark price of an attached unit is $835,300. This represents a 17.7 per cent increase from March 2017 and a two per cent increase compared to February 2018.